This is a true story about a man who convinced his family to go on an outrageous road trip in order to bring healing to his family. I immediately wanted to read this book when I saw it. I wanted to know the lengths that this family went to in order to reconnect in a culture that devalues family. I saw more than that. We meet a contrite and humbled man who tells us that he wrecked his family and had an affair. His wife filed for divorce, but he never received the final paperwork. During this year, he had a real encounter with the living God. He realized that he had been pretending in his faith up until this point. He then did the unexpected and asked his wife and children for forgiveness. This and other circumstances led Brad to seek the Lord for a radical way to win back the hearts of his family. He discovered grace for himself as a father and came to see that the true work of winning the hearts of his kids belong to Jesus. That God did. 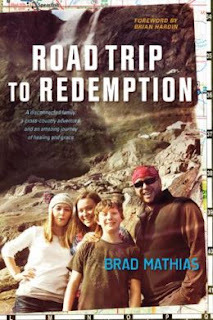 You will love seeing how God ministered to the hearts of Brad's family as they sought out this journey. You really caught the picture of the landscape of the terrain and of his family. It inspired me to win the hearts of my children. The adventure is truly rich. Indulge.